Dr. Francesca Rosi is researcher at the Institute of Science and Molecular Technologies of CNR UOS of Perugia and scientific responsible of the CNR-ISTM within the project FUTURAHMA. 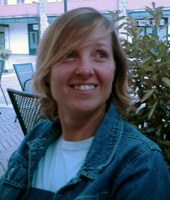 In 2005 she was awarded a Ph.D. in Chemistry, University of Perugia (Italy), dissertation title “Spectroscopic studies for the conservation of mural paintings” after which she had a Post Doctoral fellowship Project title: “Spectroscopic investigation on materials of Cultural Heritage interest” (2005-2008). From the 2008 to 2010 she was a Project collaborator with the National Interuniversity Consortium for Science and Technology of Materials (INSTM) Project title: “Mid infrared vibrational investigation in reflection mode through fiber optic sampling probe”. From November 2010 to October 2011 she was a Post Doc fellow with CNR-ISTM Project title: “Spectroscopic study of the pigment effect on the stability of synthetic polymers used as binders in modern paintings”. She is an expert on advanced spectroscopic methods for the study of Cultural Heritage materials with a particular focus on non-invasive portable systems. She has participated and participates to the following national and international projects such as HEROMAT, IT@CHA, CHARISMA ed Eu-ARTECH. C. Marchese, I. Bonaduce, E. Buzzegoli, F. Gabrieli, A. Lluveras, F. Rosi, Studio multidisciplinare sulle preparazioni di Vittore Grubicy de Dragon dai materiali dell’atelier alle opere, in Materiali d’artista. Proposte per lo studio dell’atelier del pittore fra Otto e Novecento, edited by M. d’Ayala Valva and J. Townsend, Pisa, Scuola Normale Superiore, to be published. Contribution to some records in More than Meets the Eye: New Research on the Estorick Collection, edited by R. Cremoncini and M. Patti, with the support of C. Adams, E. Buzzegoli, D. Kunzelman, C. Marchese, exhibition catalogue, London, Estorick Collection, September 23-December 20, 2015, Estorick Collection, London, 2015. F. Rosi, L. Cartechini, F. Gabrieli, D. Buti, B. Doherty, A. Daveri, A. Romani, C. Grazia, C. Miliani, Tecniche di indagine non invasive puntuali; Iidem, Supporti e preparazioni: accertamenti analitici; Iidem, La tavolozza di Vittore Grubicy attraverso le indagini puntuali non invasive; Iidem, La vernice in Vittore Grubicy attraverso le indagini puntuali non invasive, in Oltre il Divisionismo. Tecniche e materiali nell’atelier Benvenuti-Grubicy, edited by M. Patti, Pacini, Pisa, 2015, pp. 155-162; 191-193; 231-236; 243-244. F. Rosi, M. Patti et al., Designs and colors. Gerardo Dottori through non invasive investigations. In Gerardo Dottori: The Futurist View, exhibition catalogue, London, Estorick Collection, 9 July – 7 September 2014, Fabbri, Perugia, 2014. A. Nevin, S. Bellei, R. Fontana, F. Gabrieli, F. Rosi, C. Marchese, M. d’Ayala Valva, D. Kunzelman, E. Buzzegoli, and M. Patti,Futurist Painters – Interdisciplinary research on written sources, artists’ materials and paintings, in ICOM-CC 17th Triennial Conference Preprints (Melbourne, 15–19 September 2014) edited by J. Bridgland, art. 1309, Paris, International Council of Museums (ISBN 978-92-9012-410-8). D. Buti, F. Rosi et al., In-situ identification of copper-based green pigments on paintings and manuscripts by reflection FTIR Analytical And Bioanalytical Chemistry vol 405, 2013 pp. 2699-2711. F. Rosi, C. Miliani et al. Noninvasive Analysis of Paintings by Mid-infrared Hyperspectral Imaging Angewandte Chemie-International Edition vol 52, 2013, pp. 5258-5261. F. Rosi, C. Clementi, M. Paolantoni, A. Romani, R. Pellegrino, B.G. Brunetti, W. Nowik, C. Miliani. Study of Raman scattering and luminescence properties of orchil dye for its non-destructive identification on artworks. Journal of Raman Spectroscopy in press (2013). Miliani, C.; Rosi, F.; Daveri, A.; et al. Reflection infrared spectroscopy for the non-invasive in situ study of artists’ pigments. Applied Physics A-Materials Science & Processing 106; pp. 295-307 (2012). Prati, S.; Rosi, F.; Sciutto, G.; et al. Evaluation of the effect of six different paint cross section preparation methods on the performances of Fourier Transformed Infrared microscopy in attenuated total reflection mode. Microchemical Journal 103; pp. 79-89 (2012). C. Clementi, F. Rosi, A. Romani, et al. Photoluminescence Properties of Zinc Oxide in Paints: A Study of the Effect of Self-Absorption and Passivation. Applied Spectroscopy, 66; 1233-1241 (2012). Miliani C., D. Domenici, C. Clementi, F. Presciutti, F. Rosi, D. Buti, A. Romani, L. Laurencich Minelli, A. Sgamellotti. Colouring materials of pre Columbian codices: non invasive in situ spectroscopic analysis of the Codex Cospi, Journal of Archaeological Science 39; 672-679 (2012). L. Cartechini, F. Rosi, C. Miliani, F. D’Acapito, B. G. Brunetti, A. Sgamellotti Modified Naples yellow in Renaissance majolica: study of Pb–Sb–Zn and Pb–Sb–Fe ternary pyroantimonates by X-ray absorption spectroscopy. Journal of Analytical Atomic Spectrometry 2011, 26, 2500-2507. G. Van der Snickt, C. Miliani, K. Janssens, B.G. Brunetti, A. Romani, F. Rosi, P. Walter, J. Castaing, W. De Nolf, L. Klaassen, I. Labarquee, R. Wittermannf Material analyses of ‘Christ with singing and music-making Angels’, a late 15th-C panel painting attributed to Hans Memling and assistants: Part I. non-invasive in situ investigations. Journal of Analytical Atomic Spectrometry 26 2011 2216. A. Amat, F.Rosi, C.Miliani, A. Sgamellotti, S. Fantacci, Theoretical and experimental investigation on the spectroscopic properties of indigo dye journal of Molecular Structure 993 (2011) 43–51. F. Rosi, A. Federici, B. G. Brunetti, A. Sgamellotti, S. Clementi, C. Miliani, Analytical and Bioanalytical Chemistry 2011 399, 3133–3145. F. Rosi, V. Manuali, T. Grygar, P. Bezdicka, B.G. Brunetti, A. Sgamellotti, L. Burgio, C. Seccaroni, C. Miliani, “Raman scattering features of lead pyroantimonate compounds: implication for the non-invasive identification of yellow pigments on ancient ceramics. Part II. In- situ characterization of Renaissance plates by portable micro-Raman and XRF” Journal of Raman Spectroscopy, 42 2011, 407–414. Polonca Ropret, Costanza Miliani, Silvia A. Centeno, Crtomir Tavzesa, Francesca Rosi “Advances in Raman mapping of works of art”, Journal of Raman Spectroscopy 41 2010, 1462–1467. C. Miliani, F. Rosi, B.G Brunetti, A. Sgamellotti, “In situ Non-invasive Study of Artworks: the MOLAB Multi-technique Approach”, Accounts of Chemical Research 728-738 2010 Vol. 43, No. 6. F. Rosi, A. Daveri, B. Doherty, S. Nazzareni, B.G. Brunetti, A. Sgamellotti, C. Miliani “On the use of second-order modes for the analysis of the CaSO4-H2O system by reflectance FTIR”, Applied Spectroscopy Volume 64, Number 8, 2010, 956-963. F. Rosi, C. Miliani, C. Clementi, K. Kahrim, F. Presciutti, M. Vagnini, V. Manuali, A. Daveri, L. Cartechini, B.G.Brunetti, A.Sgamellotti “An integrated spectroscopic approach for the non invasive study of modern art materials and techniques” Applied Physics A Volume 100 Issue 3 (2010), Page 613. F. Rosi, A. Daveri, C. Miliani, G. Verri, P. Benedetti, F. Piqué, B. G. Brunetti, A. Sgamellotti “Non-invasive identification of organic materials in wall paintings by fiber optic reflectance infrared spectroscopy: a statistical multivariate approach” Analytical and Bioanalytical Chemistry 395, 7 (2009), 2097-2106. F. Rosi, M. Paolantoni, C. Clementi, B. Doherty, C. Miliani, B.G. Brunetti, A.Sgamellotti, “Subtracted Shifted Raman Spectroscopy of organic dyes and lakes”, Journal of Raman Spectroscopy, 2010, 41, 452–458. F. Rosi, V. Manuali, C. Miliani, B. G. Brunetti, A. Sgamellotti, T. Grygar, D. Hradil “Raman scattering features of lead pyroantimonate compounds. Part I: XRD and Raman characterization of Pb2Sb2O7 doped with tin and zinc” Journal of Raman Spectroscopy, 40 Issue 1, 2009, 107-111. F. Rosi, A. Burnstock, K.J. Van den Berg, C. Miliani, B. G. Brunetti, A. Sgamellotti, “A non-invasive XRF study supported by multivariate statistical analysis and reflectance FTIR to assess the composition of modern painting materials”, Spectrochimica Acta A 71 (2009), 1655-1662. S. Sotiropoulou, Sister Daniilia, C. Miliani, F. Rosi, L. Cartechini, D. Papanikola-Bbakirtzis, “Microanalytical investigation of degradation issues in Byzantine wall paintings”, Applied Physics A –Materials Science & Processing, 92 Issue 1 (2008), 143-150. F. Rosi, C. Miliani, A. Burnstock, B.G. Brunetti, A. Sgamellotti, “Non-invasive in-situ investigations versus micro-sampling: a comparative study on a Renoir’s painting”, Applied Physics A 89, 2007, 849-856. C. Miliani, F. Rosi, I. Borgia, P. Benedetti, B. G. Brunetti, A. Sgamellotti, “Fiber-Optic Fourier Transform Mid-Infrared Reflectance Spectroscopy: A Suitable Technique for in Situ Studies of Mural Paintings”, Applied Spectroscopy, Volume 61, Number 3, 2007, 293-299. C. Ricci, C. Miliani, F. Rosi, B. G. Brunetti , A. Sgamellotti, “Structural characterization of the glassy phase in majolica glazes by Raman spectroscopy: A comparison between Renaissance samples and replica processed at different temperatures”, Journal of Non-Crystalline Solids, 353 (2007), 1054–1059. E. Carretti, F. Rosi, C. Miliani & L. Dei “Monitoring of Pictorial Surfaces by midFTIR Reflectance Spectroscopy: Evaluation of the Performance of Innovative Colloidal Cleaning Agents, Spectroscopy Letters, 38 Number 4-5 (2005), 459-475. F. Rosi, C. Miliani, I. Borgia, B. Brunetti, A. Sgamellotti “Identification of nineteenth century blue and green pigments by in situ XRF and micro-Raman spectroscopy” Journal of Raman Spectroscopy 35 (2004), 610-615.